In a food-centric city like Omaha, doors are always opening and closing. Coffee shops, ice cream parlors and pizza places are always looking to add their names to the best of the best, and casual dining spots elevate their craft to compete with the most gourmet games in town. The Reader has taken a look at some of the most promising recently opened [and soon-to-open] menus in the area to create a new-to-do list for your summer. Willy Theisen may be Omaha-famous for founding Godfather’s in 1973, but the man has a sophisticated side that goes far beyond the ubiquitous taco pizza. Having formerly stood at the helm of Green Burrito and Famous Dave’s, Theisen upped his pizza game when he laid his golden hand upon Dundee to open Pitch Coal Fired Pizza, which he owned from 2008 to 2012. Paragon, his newest local venture, occupies the space formerly home to Grandpa C’s Market at 50th and Underwood in Dundee. The kitchen received a touch of elegance with the hiring of former M’s Pub chef John Rea. Set to open any day, Paragon’s “upscale comfort food” is high on my priority list. Bartholomew is enlisting Omaha’s freshest, most original minds to man the pop-up stand in the Greater Omaha Chamber Courtyard at 13th and Harney. The weekly lunch features a revolving door of chefs; each eager to offer a sample of what could be — test-driving concepts before committing to brick and mortar establishments. Creativity is king, and the stand has already been home to chef Tim Maides. The brilliant mind behind TREAM [Tacos Rule Everything Around Me] and Benson Soap Mill, Maides has mastered the art of the pop-up, and his turn at Dandelion may be just the inspiration he needed to plant some roots. [That’s a hint, Tim. The world wants tacos!] Bartholomew is always looking for more talent to man the stand, and all creative culinary artists are welcome to share the love. In addition to his sustenance stand, Bartholomew also has set his eyes on Little Bohemia. The tiny taste of Czech country between south 10th and 14th streets has been the center of much attention as efforts have been made to revitalize the area. When it was announced earlier this year that the heart of the neighborhood, The Bohemian Cafe, would be closing after 92 years, it became easy to deem the effort as futile. However, in addition to the rumors of a queue of possible buyers hoping to keep the cafe alive, other efforts in the area will serve to keep the neighborhood’s pulse strong and steady. Currently in negotiations, Bartholomew is planning to open Boho Rice, Little Bohemia’s future fried rice shack. A tasting menu test-run of the concept combined both traditional Asian entrees and modern munchies to satisfy your kimchi cravings. Bibimbap, which literally translates to “mixed rice” is served with seasoned sautéed vegetables and is gently spiced with chili pepper paste. The lotus root and beets two ways [hot and cold] is almost too beautiful to sink your teeth into, but the freshness of the vegetables and the texture adventure makes the dish worth destroying. The menu’s playful side includes kimchi and porkbelly pancakes, mochi ice cream, and red bean and matcha popsicles. A drink menu offers a white grape drink served with whole grapes, and a sweet Korean rice drink called Sikhye. True to Bartholomew’s style, the restaurant will cater to vegetarians as well as carnivores, and plans to offer very late night hours with a walk-up window. If you find yourself on the brink of divorce over the question “Where do you want to eat tonight?” skip the attorney and instead look up Paul Kulik. It hardly matters which of his establishments you choose, you will be in for an amazing meal in an exceptional environment. There will be no stories of rude staff, under- or over-cooked fish, or broken sauces. Kulik holds his team to the same standard he holds himself to, which is quite astronomical. When Kulik announced he was getting behind a pizza and pasta place, Omaha knew it wasn’t getting yet another greasy guilty pleasure. 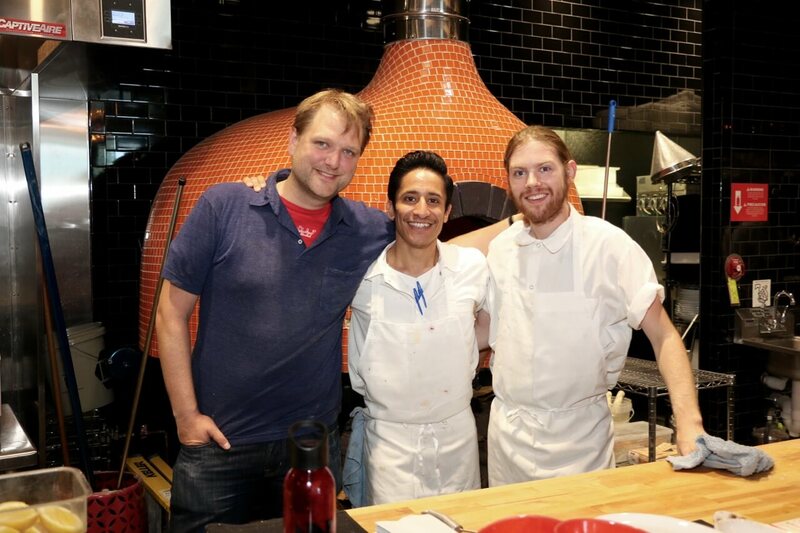 Via Farina, which opened in May, boasts a pizza dough made through a painstaking three-day process of rising, tossing, rolling and more rising. The delicate pastas are made in-house, and the ingredients are very selectively sourced. Kulik’s years of developing relationships with local growers and suppliers is evident in the quality of ingredients used in each dish. Also evident is his keen eye for talent. Sous chef Kye Adkisson is no stranger to the high-end kitchen. A resume that includes Spencers for Steaks and Chops, The Boiler Room, and Le Bouillon is an excellent start to a culinary career. Chef De Cuisine Piero Cotrina is thriving in the high pressure environment. Born in Peru, the genuinely likable Cotrina marvels at the magic that is made in Via Farina’s kitchen, stating humbly “It’s just flour and water, and it makes something so amazing!” The ingredients are only that, and something amazing is what happens when Kulik, Adkisson, and Cotrina step behind a concept. The men have taken the fresh, fun and flavorful menu to incredible heights, and are hoping to take it on the road. A test fleet of Vespas have been employed to deliver the delicious dishes to nearby noshers in need of something wholesome. A charming young couple sit across from me during the break in their restaurant’s hours. The little window between lunch and dinner service is when chef/owner Kyle Anderson and his team clean and prep for the next meal. A sweet little toddler named Baela usually runs around the empty dining room causing the havoc that only tiny little hands can get into, and her mother Rose Anderson, general manager and co-owner, smiles patiently, the peaceful reminder that sometimes, you’ve just got to get into stuff. That’s what Kyle, formerly of V. Mertz, and Rose were doing when they closed their California eatery “Slow” and moved back to Dundee. The high ceilings and gorgeous décor lend an ambiance that is cemented by the menu. I ask, slightly overwhelmed not by the size, but by the quality of the menu items, what each of the two owners would recommend. It’s quickly obvious that they face the same dilemma, as they simply start excitedly reading the menu to me. “The crispy pig ears, definitely. Oh, the nuts and pork!” Rose offers, harmonized by Kyle’s insistence that the duck or the Wagyu tartar are always incredible. We were still fighting with ourselves about what one should order if they were to come only once when I asked the couple about their passion for local sourcing. Kyle was almost dismissive about it, as he feels that the onus should be on places that refuse to ethically and sustainably source their food. There should be restaurants, and “non-sustainably sourced” restaurants, he said. Cutting Room for AugustGood Bad Guys or Bad Bad Guys?